There is some superb diving in Thailand, especially in the Andaman Sea. You can book the diving before you go, or just turn up and book a day or two before. The best time to go to the Andaman Sea side of Thailand, on the west coast, is between November and April when the weather is calm and the visibility good. From May to October is the rainy season. You can fly to Bangkok then take a train or a bus south. Or fly to Phuket. The public transport in Thailand is very good - better and cheaper than the tourist buses. The best dive sites are away from the main islands, especially Koh Similan, Koh Surin, Hin Daeng and Hin Moung. These are often reached by liveaboard. As well as the diving, Thailand is famous for its food, temples, beaches and extremely friendly people. If you need a dive centre elsewhere in Thailand see the Gulf of Thailand Dive Operators. Local Dive Thailand is one of the few full stack dive companies in Phuket, with two operational and fully purposed scuba diving tour boats—the M/V Chok Somporn and M/V Kepsub—running daily dive trips to Phi Phi Island, Racha Yai/Noi and the King Cruiser Wreck. Though there are many other dive companies and some other dive boats to choose from, LDT is simply the only choice to make if you want to ensure that you have the best day possible while diving and access to the most exciting scuba diving sites Phuket & Phi Phi have to offer! Read more about Local Dive Thailand. 161/47 Chao Fa west Rd. Offering a full range of liveaboard options from budget to luxury. Boats for all experience levels. Liveaboards departing from Khao Lak and Phuket to the Similan Islands, Koh Bon, Koh Tachai, Richelieu Rock plus Hin Daeng, Hin Muang, Phi Phi and the Mergui Archipelago. Specialist advise. Multilingual service. Dive courses, day trips, snorkeling, tours, accommodation and transfers also arranged. Trips to the Similan islands or Burma Banks. From 5 to 8 days. Trips to the Similan and Surin islands for seven or five days. From Phuket to Khao Lak, Khao Lak to Phuket or departing and arriving at Khao Lak. Visit Similan, Koh Bon, Richeliu and Surin islands in the North Andaman Sea. Length of trip is 7 nights/8 days and the liveaboard departs from Thap Lamu. Trips to the Similans, Koh Bon, Koh Tachai, Surin, Richelieu or Hin Daeng and Hin Muang for five to seven days. From Chalong Bay, Phuket. Trips to the Similans, Koh Bon, Koh Tachai, Surin and Richelieu for four nights / five days. Also trips to Myanmar - Mergui Archipelago, Burma Bank and Black Rock. Khao Lak is north of Phuket and much quieter. It is good starting point for the Similan and Surin islands. Similan Diving Safaris is an eco-friendly western managed PADI 5 Star Dive Center located in the heart of Khao Lak. They have 16 years experience specialising in Liveaboards to the Similan and Surin Islands, Bon & Tachai Islands and Richelieu Rock. They also dive the Mergui Archipelago, Myanmar (Burma). All major European languages are spoken on their boats and they can help with airport pickup, rooms and transport to and from Khao Lak. "I and my girlfriend had a great lifeboard at the Similans and Richelieu Rock with Similan Diving Safaris from 22 to 26 December 2007. Simply Great! Both the diving and the Thai staff were fantastic: professional and funny in the same time. I will return! " "I just wanted to comment that i just did an excellent liveaboard to the Similan Islands with 'Similan Diving Safaris' based in Khao Lak. Their price appeared to be the cheapest in town, but the quality of the boat, guides, Thai boat staff and indeed everything was first class. Anybody on a bit of a budget should definitely check these guys out! " "My wife and I wanted to get certified and book a liveboard with a reputable dive operator. After searching online for several hours, we decided to go with Similan Diving Safaris. I was still not sure what to expect until we arrived. We did our theory the day before our liveaboard departure and had an awesome instructor. In fact, the entire staff was incredibly friendly, helpful and professional. What a fun bunch! After completing our Open Water Course, we decided to do our Advanced Certification in order to further improve our skills and expand our diving horizons. It was a great call. We learned how to improve our bouyancy control through the Peak Performance Bouyancy course and greatly improved our confidence. Besides the diving, the food on board was delicious, far exceeding my expectations. you will not starve while aboard the Dolphin Queen. The guides on our liveaboard were amazing. Thanks Amy, Seth, Stefano, Jello, Sabrina and Van! 4 day/4 night Liveaboard at the Similan Islands + Open Water Course: ~$700 per person"
"We had a fantastic time diving with these Guys. Everything was great from the accommodation and food on board to the amazing dive sites and encyclopedic knowledge of the guides and instructors." "I had a fabulous time diving in the Similan Islands with Similan Diving Safaris. The dive staff and crew were really friendly and professional. Good dive briefings before every dive, great food (vegetarian available), and well run ship! I would definitely recommend them and would love to dive with them again. Joe (the owner) was very accommodating and helpful and did his best to ensure everyone had a good experience." Daytrips and live-aboard cruises to the Similan Islands as well as to the neighbouring sites Koh Tachai and Koh Bon. Additionally offer a full range of SSI and PADI certification courses as well as being a BSAC resort centre. PADI organisation departing from Khao Lak. "Absolutely fantastic ! I did my Divemaster with them, they're the ones who really taught me dive. What a professional outfit. " Multilingual German operation with branches in Khao Lak, Phuket, Koh Phi Phi and Pak Meng. "Learned to dive (PADI Open Water) with SeaBees in Feb 2008 - brilliant local instructor (Dokmai "Born" Chada). 1st class equipment, boats, instructors and local knowledge. Courses include PADI and SSI through to Tech and Instructor diving. Going back March '09 to learn more. Tried the 6-day liveaboard to the Similans with SeaBees in Nov '08. No big fish, but superb diving. Boat and crew were absolutely 1st class - cannot recommend them highly enough. Outstanding." PADI dive centre under German management. Offers Similan Islands day trips and liveaboards, and snorkelling tours. Scuba diving with whale sharks and manta rays in Thailand. 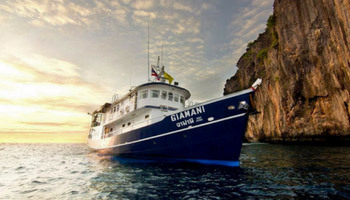 Liveaboard safaris to the Similans and surrounding areas. Diving and snorkelling trips to the Similan Islands, Koh Bon, Koh Tachai, Richelieu Rock and Surin. 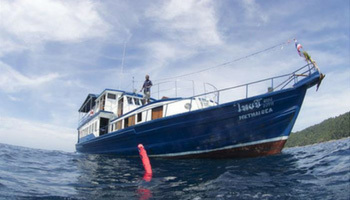 Overnight liveaboards and PADI advanced courses available. Diving and snorkelling at the Similan Islands and beyond. Small dive company providing safe, ethical diving. Koh Ngai is in the South of Thailand. By starting from here you can do many excellent dives as day trips, none better than Hin Daeng and Hin Mouang (Red Rock and Purple Rock) which you really shouldn't miss. You can do these dives with dive operators in Phuket, Koh Lanta or elsewhere - but only on liveaboards as the journey is so long. For a day trip, and just a three hour journey, stay in Koh Ngai (pronounced, and often spelt, Koh Hai). From Bangkok fly to Trang. A minibus at Trang airport will take you to whichever hotel in Trang you choose (Ko Teng Hotel is clean and cheap) - or to the bus station if you prefer. Buy a ticket inside the airport. From Trang you can either use a travel agency and take tourist buses and boats - or use the local buses, ferries and longtail boats. We recommend the latter - cheaper and generally better quality transport. Take a bus to Pak Meng. From there take a ferry or longtail to Koh Ngai. You can also reach Koh Ngai from other islands. The Koh Lanta ferry calls in at the Koh Hai Resort. From Koh Muk it's easy to get someone to take you by Longtail to whichever resort you choose. There is only one diving outlet on Koh Ngai, run by a relaxed German. Highly recommended for local knowledge and friendliness. Operate from November to April. Attached to the Koh Hai Fantasy Resort. PADI. Koh Muk is another good starting point for Hin Daeng and Hin Mouang. There are two areas in which you can stay - Koh Muk resort and Hat Farang on the opposite side of the island. Hat Farang is by far the better beach. Charlie Beach Resort has a diving centre. You can change money at Charlie Beach Resort. "My family and I had the pleasure of diving with Alex of Princess Divers of Koh Muk (Charlie's). Alex was very professional, and we had safe, beautiful and fun dives. We dove Hin Daeng, and another trip to Hin Rok. We hope to make it back next year. We are very sorry to hear about the loss at Princess Divers on Phi Phi. Our hearts go out to the families involved. Another option for diving Hin Daeng and Hin Mouang is to start from Trang. Trang is a town on the coast of Thailand with an airport. You can fly there from Bangkok. Alternatively you can travel by bus or by train. Visits Hin Daeng and Hin Mouang, Ko Ha, Ko Rok, Similans and Richellieu Rock. "Very environmental friendly operator, friendly and professional dive masters and reasonable price "
Libong Beach Resort is a small resort on the largest island near Trang, 10 km southeast of Koh Muk. You get to Koh Libong by taking a longtail boat from Hat Yao Pier in Trang. 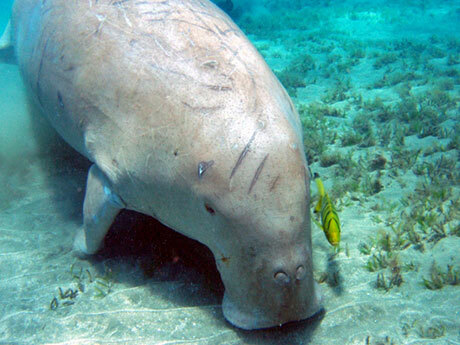 Koh Libong has what is thought to be the largest seagrass area in Asia and a resident population of dugongs. This island is still quiet with fewer tourists than many others. There is one dive operator: Jolly Roger Dive Centre. Visits Hin Daeng and Hin Mouang, Koh Muk, Koh Kraden, etc. Koh Lanta is north of Koh Ngai and is a much larger island. A lovely place to stay. It has red roads, long beaches and thick forests. The capital, Saladan, is home to several dive operators. Open from mid-October to the end of April. We are based in the South of Ko Lanta, near the National Marine Park. Nestling in a quiet corner of the Narima Resort, Narima Diving offers you a relaxed and safe environment from which to dive. Narima's experienced dive team has a wealth of local underwater knowledge built up through thousands of dives in this area. Our love of diving combined with our personal approach mean we can offer you rewarding dives regardless of your level of experience. Narima Diving offers the latest PADI Multi-Media learning resources with expert supervision and guidance from our team of PADI professionals. You can expect a relaxed and personal service both above and below the water. We are an approved Mares Dive Centre and all our equipment is of the highest standard. All dive trips include equipment hire, an experienced guide or Instructor, small groups, breakfast, lunch, fruit, soft drinks and water. Narima Diving is the home of Liquid Lense a well established and published Underwater Videography and Photography company. "We would like to let everyone know what happened on the day of the tidal wave. Both the West and East coasts of Ko Lanta were hit by seven big waves on 26th December (2004) at around 10.30am. Two of the waves were very big, and it was these two that caused most of the damage to the island. Here at Narima, the largest wave came up over the swimming pool and sucked most of the water out. It also claimed all our brand new bar furniture and many of the sun-loungers. Thankfully this was all that was damaged. There was a mother and daughter swimming in the sea, but they realized something was wrong when the water first started to recede and were able to run to safety before the wave came in. Narima is functioning normally now (with a few missing items from the menu!) and the good news is that the beach now has lots of sand again! Saffron & Iris were diving with 5 divers at Bidah Nok at Ko Phi Phi. All the divers were in the water when the waves came and were pushed several hundred meters out to sea by a strong current. Fortunately this was the safest place to be and we were able to return to Ko Lanta a few hours later. All divers from Ko Lanta returned safely that day. Ko Lanta's main town Saladan (in the North) was extremely fortunate and only suffered minimal flooding as the water levels rose & fell - they did not experience a wave as the west and east coasts did. Tthe Similans and Southern islands were largely unaffected by the calamity. " Booking office for selected dive schools in Thailand, including Koh Lanta. Go Dive Lanta is a PADI Dive Centre on Koh Lanta which is a tranquil island in Krabi Province, Thailand. We have experienced instructors that speak a wide variety of languages. Join us for scuba diving and snorkelling trips to the beautiful dive sites of the Southern Andaman Sea. We regularly visit the world famous Hin Daeng & Hin Muang, Koh Haa, Koh Bida and the Phi Phi Island group. We also dive at Shark Point, Anemone Reef and the wreck of the King Cruiser. We also offer an extensive range of great value PADI courses - from Discover Scuba Diving for those taking their first breaths underwater up to Dive Master and Master Scuba Diver. "I think this is the best dive center I ever dived with. They give all the information you want: thay do a very professional briefing and tell you exactly what are you going see, where to go, where the sea horse is, where the ghost pipe fish is, etc. After you come out of the water they also do a good debriefing - telling you everything you saw. I can only say this is the best dive center I've ever used. " Eco friendly (Green Fins & PADI Green Star awards) diving and snorkelling trips. Hin Daeng only 75 minutes by luxury speedboat. All PADI diving courses to Instructor. Open 10am - 8pm. "Brilliant place to dive, very informative and helpful staff. The speedboat is very cool! Breakfast and lunch were served on a deck at the back of the centre and we all just chilled out and chatted after we returned. Also, very environmentally friendly with specific eco briefing on the boat and information available throughout the dive centre about their projects. Great value for money, had breakfast and lunch and a free beer at the dive centre, fruits and amazing Thai snacks on the boat. Better than other places, very friendly atmosphere, professional staff, very safety conscious. I would definitely recommend these guys "
Diving & snorkeling trips to Koh Haa, Koh Bida, Phi Phi Islands and Hin Daeng/Hin Muang from Koh Lanta. PADI courses from beginner up to Instructor and technical diver training. A new small personal PADI dive centre, set within Baan Laanta Resort Spa, located in the South of Koh Lanta. Offer the full range of PADI Scuba Diving courses. Aim to offer rewarding dives, regardless of experience. The dive season runs from mid-late October to the end of April. Scubafish is home to LIQUID LENSE a well established and published Underwater Videography and Photography company. Departing from the beach each morning at 9am, their two speedboats carry a maximum of 10 divers each. PADI courses available in several languages. 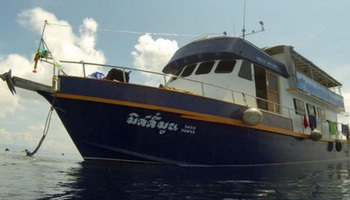 Liveaboard trips include to the Similans, Hin Daeng and Hin Mouang. Established 2009, Anti Gravity Divers is on Klong Nin Beach in the south of Koh Lanta. They will pick you up from your resort and drop you back after their trips free of charge. They dive the world class Hin Daeng and Hin Muang as well as Koh Ha, Koh Bida and Koh Rok. "I dove with them for 4 days- DMs and instructors were friendly, but somewhat rushed on the dives. The owner, though, was absolutely a slimeball and would say anything to sell dives or equipment. I would not recommend this dive center at all - it was the only time in 4 months vacation in SE Asia where I felt like I was getting ripped off. However, if you are doing free diving, they are one of the few places in Thailand that offer it. Wish I had gone with Go Dive! (Across the street.) "
There are many diving operators on Koh Phi Phi, the majority in Ton Sai Bay. MV Excalibur cruises visit world-class diving destinations: places such as the Similan and Surin Islands, Richelieu Rock, Koh Bon, Koh Tachai, Hin Daeng, Hin Mouang and the renowned Phi Phi Islands. "I have dived with Princess Divers on phi phi island for 3 years now and will return next year. They are always professional and provide an excellent service at really low prices. I can't believe how cheap when my credit card bill comes through. " "Princess Divers in Koh Phi Phi were excellent, I trained there for my PADI. Everyone was very friendly. The diving there is amazing. I saw a black tip reef shark, leopard shark, loads of turtles, a sea snake, stone fish and eels. I enjoyed it more than the barrier reef! " "A very professional diveshop. " Specialists in Hin Daeng and Hin Mouang and offer regular trips to Koh Haa. Offer all PADI Courses in Norwegian, Danish, Swedish, Dutch, English, German and French. Regularly conducts Instructor Development courses. "Visa Diving Center request tips from customers who are on the dive trips, not for the dive center nor for the instructors, but for the local Thai people who help on the diving trips. I'm very impressed and happy that they care about local people. " "Visa Diving Center was the one that I discovered as the most professional dive center in Phi Phi. They were the only one asking about when I was flying and if I was healthy. I had great dives with them, so I would really like to recommend them. " Offer day trips to Hin Daeng and Hin Mouang, to 25 local sites and to the wreck of the King Cruiser. Courses in English, German, Danish, Swedish and French. PADI IDC center. Experienced staff who have been with the company many years. Blue View Divers is an eco friendly Green Fins dive operation offering daily courses with PADI and SSI, and daily diving trips to the local marine park of Phi Phi Ley and the Bida Islands. Offering late and flexible departure times, beach lunches and small groups. Multilingual German operation with PADI branches in Khao Lak, Phuket, Koh Phi Phi and Pak Meng. Krabi is on the coast of the mainland. If you're looking for nightlife and activities, Krabi, and it's nearby beaches and islands, are for you. Many guesthouses and cheap hotels, loads of bars: part of the backpackers route. Tons of things to do, like sea kayacking in mangrove swamps and caves, or climbing. For climbing take a boat to Railey or Phra Nang (you can walk between these two beaches and stay in bungalows here). There are many diving operators in Ao Nang (a bus ride from Krabi) and some on the Railey peninsula. Most also have booking offices in Krabi itself. To see hotel prices in Krabi visit the Agoda site. Lots of shops in Krabi, but generally the same things are cheaper in Bangkok. For clothes try the market; cheap but fairly well made. From Bangkok you can fly to Krabi. From Koh Ngai or Koh Muk take a boat to Pak Meng, from there catch a bus to Trang and from Trang bus station catch a bus to Krabi. "Excellent tuition, the instructors were very thorough and clearly loved their job and diving! Very good value for money too. The liveaboard was fab!" 5-Star IDC dive center under swiss and English Management. Offices at Ao Nang Beachfront and the Sheraton Krabi Beach resort. Offers daily whale Shark and manta ray dives by speedboat from Ao Nang Beach, PADI dive courses, dive tours including longtail dives, Phi Phi Island diving and full liveaboard tours. "The instructor here was excellent. He was very patient and made us feel completely at ease in the water. I hope to visit again soon." Multilingual PADI Gold Palm Resort. Daytrips to Phi-Phi, the King Cruiser Wreck, Hin Daeng/Muang, etc. Liveaboards to the Similans Turaotao Marine Park. PADI courses from beginner to Pro. Nitrox, Cabern, DPV and night dives. "Really friendly, professional service: Staff were always fun, knowledgeable and keen to help. Scuba Addicts come highly recommended! The only British owned and managed diving centre in Ao Nang. I certainly noticed a difference just in terms of managing my expectations, offering impartial advice and trying to make my two weeks as fun as possible, even out of the water." Teach in English, German, Swedish, French, Dutch and Thai. PADI. Diving and snorkeling tours to the Ao Nang local islands, Phi Phi, Shark point and the King Cruiser wreck. PADI courses from beginner up to technical and sidemount diving education. Located in the heart of Aonang, the beachside town of Krabi, in the Sea of Love PLaza. KrabiDivers.com provides dive courses, trips, liveaboards, dive equipment sales and also helps customers with hotel bookings and other arrangements. "My friends and I had to book last minute for some fun dives. KrabiDivers.com not only made all the arrangements including the hotel, they also took care of our entertainment after the dives, and in the end we all hung out together, had a party at night and it made our short getaway really enjoyable! " The team at Poseidon aim to make your vacation an unforgettable one. "Our philosophy is to offer you fun and relaxed diving whilst maintaining our professionalism and high safety standards." Scuba dive Phi Phi, wreck dive the King Cruiser, dive with Manta Rays at Hin Daeng or explore the caves of Ao Nang's dive sites. SSI, CMAS, PADI scuba diving courses available via Stingray Divers, Ao Nang, Krabi, Thailand. Open year-round. Family owned and operated PADI Dive Center located in a quiet Thai village in the Ao Nang area of Krabi. Pool and all training facilities located on-site. Daily dive trips to Koh Phi Phi islands and Ao Nang local islands. The Similans are another excellent diving destination in Thailand. They are a national park comprising nine small islands 90 km Northwest of Phuket. There are no dive operators on the islands: to do them justice you need to take a liveaboard. Khao Lak and Thap Lamu are the closest places from which to travel, but boats also operate out of Koh Lanta, Phuket and Ao Nang. Thap Lamu Port is the nearest port to the Similans. The easiest way to get there is to go to Khao Lak and get a taxi. Visit Similan, Bon, Richeliu and Surin islands in the North Andaman Sea. Length of trip is 7 nights/8 days and the liveaboard departs from Thap Lamu.
" When you cannot fly direct to Phuket, fly into Bangkok then take Air Asia to Phuket. Very cheap one way flight and so much better than an awful bus ride. Been there done that. I have dived many places in Southern Phuket and highly recommend a visit at the 1st of April. 40-60% off most Resorts but still great weather & visibility. " Bring a Go-Pro Camera and ignore the Dive Sites who ask you not to carry your own knife while diving. Oddly enough this has happened to me on more than a few dives and I have been adamant that I always carry my own knife during a dive. Safety first always. Enjoy the beautiful crystal clear waters of the Andaman, swim with turtles, discover Moray, swim along side schools of large Tuna, and a whole lot more. :) "
For trips to the Similan Islands, Richelieu Rock and Burma Bank. Accomodates up to 21 divers in 2-bed, 3-bed and 4-bed cabins, or in the luxurious master double cabin. "I just finished my advanced diving with Thailand divers and had a wonderful experience - right from booking the course to receiving my new dive card. The whole process was easy enjoyable and very professional. The dive instruction was brilliant and I was lucky enough to have one-on-one for my course. I felt completely at ease and thought that the equipment was of a very high standard and made me feel very safe. The dive sites were interesting and varied and the boat rides out there were fun. Food was great, the boat crew really helpful and friendly. All in all - this dive team way surpassed my expectations and I would recommend and encourage anyone to go on a trip, dive or do some further training. " 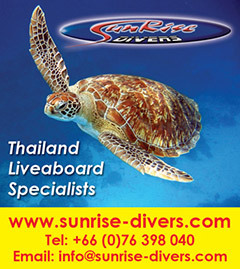 "Diving with Thailand Divers was a very smooth, exciting and safe experience. The preparations, the boat and facilities, the dive master, the equipment, the dive site instructions were excellent - defintely worth the 10-15% extra price, compared to the less serious and less safe competition. Highly recommended. " "Hi Thailand Divers . I would like to give a big thank you to you all for the 5 star service. Thanks to Tony (manc) for taking the call and especially to Brian and Stephen for the time and patience on the open water course. Im sure they were glad it was finally over. I would like to return to this center in the future who knows maybe I will for some more fun. Had good night on the thu t'was a night to remember thanks guys appreceiated it. And Brian remember to send me some info for sites back here in scotland and a link to your facebook when you get a chance. Thank you all once again. " "I went diving with Thailand Divers on a 4 day dive cruise after having completed the Enriched Air Diving course with Thailand Divers . The dive sites were spectacular, especially Richelieu Rock. Our instructor diver Chris showed us around to all the great sites to see and made this trip even more woderful. Many thanks to the Thailand Divers team for making my Thailand Diving Experience such a great one. " "I recently obtained my PADI Licence with the Thailand Divers crew. My instructor for the three days was Chris ( aka Mr Cruise! ) Chris made everything so easy and explained every little detail to us so clearly! I found him and the staff at Thailand Divers so professional and they made my diving experience so amazing! Had so much fun for the the three days, but the most important thing was the safety and Chris ensured that everything we did was safe, which it was!! Chris and the lads from Thailand Divers are sound top lads,and am heading back in November to do my advanced with them! Chris thanks again for being patient and making it the best experience i've ever had! Will give you an email when I'm heading back to Phuket,take care mate, AWESOME!!! " "I was in Phuket last week and i did my PADI open water course with Phil. Thank you Phil for the extra time you spent with me to enable me to complete the course. I had a great time with you all at Thailand Divers. I look forward to coming back and diving with you again. I am new to diving but my experience with Thailand Divers was brilliant. I would recommend this company to anybody looking to learn how to dive. " "I recently went diving with Thailand Divers . I have been diving for years now all around the world and this has to be one of the best diving companies I have been with. They had a brand new shop, classrooms, equipment and boats. This is due to the Tsunami and they lost everything as they are located on the beach in Patong. I went there to see if the Tsunami had affected the reefs and I am pleased to say they are beautiful and untouched. Their new boat had everything you would ever want on a day trip boat. Showers, towels, bar, music and more. The best thing for Thailand was that there were no hidden costs as everything was included in the cost of the trip, lots of great food and all drinks. Usually Thailand companies charge extra for these facilities. A very nice change. Excellent value for money. I would recommend this company to anybody who has been diving for years or who is about to start." "What can i say...unbelievable location...the friendliest people I have met in my years experience of diving...I got a free t-shirt, free CD of my underwater pictures, free BBQ and met some amazing people with loads of advice (they even sorted me out with accommodation)...what they say is true, Thailand Divers is not ONLY a dive school...it's a social life! " Dive The World offers diving in the Similan Islands, Hin Daeng, Phi Phi Islands, Krabi, Khao Lak and Burma, specialising in liveaboards and private instruction PADI courses. "Sheldon Hey, the Australian ex-pat who owns Dive the World Thailand answered all my questions and worked with me on an itinerary. He picked out the dive boats I used in Phuket and Phi Phi Island. He also arranged all my transfers (seven) in air conditioned taxis." "If you are a first time visitor to Phuket and want to check out several dive operations, I recommend Dive-The-World.com. The folks there set me up with a hotel room in my price range and arranged a week of diving with various operators, based on the type of diving I wanted and my preferred locations on specific days. Less than $700 for the week for room and diving. Everything was handled via email prior to my arrival. I forgot my wetsuit on this trip. A Dive-The-World.com employee/DM drove out to my hotel that first night with a suit for the week. No charge for the service or the suit." Booking office for selected dive schools in Thailand, including liveaboards in the Similans, Surin islands and Burma banks. Sunrise Divers is a PADI 5 Star center and has been operating at Karon Beach, Phuket since 1999 offering liveaboards to the Similan Islands and local diving around Phuket and Phi Phi. PADI diving courses and daily dive trips in Thailand, Burma, Indonesia and Malaysia. Whaleshark and Manta expeditions from Phuket, Thailand. Hidden sites and pristine Beaches. SSI dive shop - your specialist for SSI dive courses and dive trips. 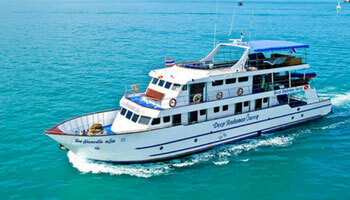 Liveaboard excursions from Phuket in the Andaman sea and retailer of all kinds of water sports gear and sportswear. Pro-Tech Dive College are a specialist Technical Diver Training Centre offering PADI DSAT and TDI programs from Basic Nitrox to Advanced Trimix courses. Technical Day diving also available to dive the great Deep Wrecks of Phuket. "Truly a disappointing experience. I would never dive with them again. Nice web site, but unfortunately it's all smoke and mirrors. I paid in advance for a dive master internship, and was forced to stop half way into it. They do not have the instructors, students, or facilities to provide a PADI dive master course. Dive shops like this reflect poorly on the entire dive community. " "Never ever advise any one to dive or study with pro-tech dive college. I did my rebreather course and payed in advanced more than 1500 US dollar for nothing, 8 days in classroom for theory and one day in swimming pool and decide to quit the course. All 8 days the instructor said all the time "you are not fit for rebreather and rebreather not for recreational diving". They pushing the students to quit the course. There was me and another student, I don't know him also quit in his last dive. " "We highly recommend Sharkey Scuba - Karon Beach, Phuket, Thailand. If you are traveling to Thailand, you have to dive with Iain, Oui, and Max of Sharkey Scuba. They will take you to the best dive sites, from the Similians, to Phi Phi. My complete family (myself, my spouse, and three sons) have trained with Sharkey and received Open Water thru Advanced and Rescue Diver ratings. Sharkey is a family run operation that puts safety first, pays attention to all the details, custom tailors dives, and trips, to your specific needs and desires. Iain, Oui, and Max love the sea, they know where to go, and they take good care of the enviroment. They dive in a safe, relaxed, manner that allows you to maximize bottom time and get the most for your money. My three sons (ages 17-12) are budding Marine Biologists mainly due to their positive and motivating experiences with Iain, Oui, and Max, of Sharkey Scuba. " PADI beginner courses in small personal groups, beach and shore diving as well as daily dive trips to the Phi Phi and Racha Islands. Liveaboards to Similan Islands. "I can highly recommend Kon-Tiki Diving in Phuket Thailand. They are now running the fastest boat in Thailand to the Similans Island for snorkelling and diving. I'm an avid diver - they looked after me a treat. A professional company with fantastic facilities - well done! " "They are an excellent outfit, good boat and charge the same as everyone else. " "Kon-Tiki Diving in Phuket Thailand has an excellent service, great boats and instructors with a true feeling for safety. I sure will dive with them again. " 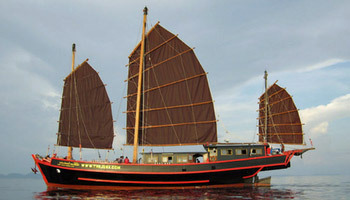 Liveaboards to Burma (Myanmar), the Similan Islands or Hin Daeng. PADI courses in n English, German or Thai. 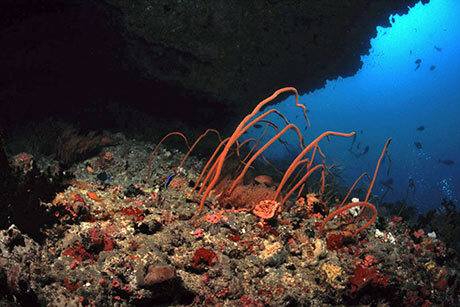 "I have spent one week diving this this outstanding dive center. The prices of Santana are very reasonable. The service they are providing is outstanding. " "Just finished an internship to "Go Pro" with this dive centre. Had the time of my life - I would definitely recommend it ! I also got a free liveabord trip to the Similan Islands with was incredible! (58000 Baht, December 2004) "
PADI 5 Star center specialising in diver education, daily scuba diving tours and liveaboards. "Absolutely first class service. PSC have taken me through both OW and AOW courses in a friendly and professional way. 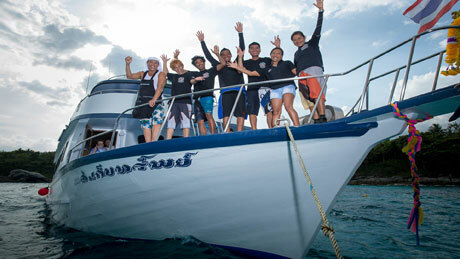 I have no hesitation in recommending them to anyone thinking of diving in Phuket." "The absolute best and only operation to dive with in Phuket. " "(Tsunami) Luckily all of our staff, customers and local friends from Kata Mama, Pen's restaurant and the Boathouse areas are ok. Our furry friends too. From the dive club, both Kevan and Instructor David were incredibly lucky and we are all happy that they managed to hang on and climb for dear life. We also learned that our Thai Instructress - Khun Tu who certainly does not believe in overexertion - has developed some amazing sprinting skills. Considering entering her for the next Olympics. Otherwise Kata Beach is being cleaned up and we are amazed to see how the Thais are working so quickly and how wonderful they are to the tourists during times of trouble. In all the year's that we have been here we have never seen them act so fast!!! :)) Bless these wonderful caring folk. The restaurants are being rebuilt, hotels repaired and at this stage we are not sure if we are going to rebuild our beach branch which we opened earlier this year.Fortunately our main dive shop was not affected as it was protected by The Boathouse Hotel. So we will never again complain about this establishment ruining our view of Kata Beach. For those of you who want to know about your planned holiday and the diving - it is back to normal again and all local dives, daytrips and Liveaboard cruises are in operation. Phuket has the infrastructure to cope immediately so please do not believe the media reports about the diseases and lack of water and food etc. With countries ordering their nationals to evacuate this will cause more harm to Thailand than anything else.The media destroyed tourism in Thailand before over the Bali bombings,SARS, Bird flu etc etc. Phuket is still beautiful! Friends we are so lucky to have survived this awful disaster and we are mourning with you for those who were not. Our sympathies to the families and friends who have lost their loved one's. Wishing you a Happy New Year. Sawatdi Bpi Mai!!! Regards from all at the club "
Daily scuba diving at destinations like Shark Point, Phi Phi islands and Similans. Live-aboard diving to Similan islands, Phi Phi, Hin Daeng and Hin Mouang. "Knows all the boats, and gives excellent advice. Also lots of liveaboards on offer. " "This is surely the best liveaboard boat I have been on, Colona VI. Comfortable cabins, with aircon and your own toilet and shower. The staff assistance was just wonderful. The Divemasters, Mark and Raoul, were I think the best divemasters I've ever dived with. They were great fun and very well educated in the diving area, which was the Similans amd Hin Daeng / Hin Munag. Highly recommended. They also have another boat coming out soon, Nautica. We have just booked another trip for March. Just great! Excellent value for money and the diving much better than Australia (GBR) or the Red Sea. " "Great pricing, very friendly and hardworking, based in Phuket - Colona group. Nice boat, well laid out and comfortable. Excellent value for money, level with some of the best. Definitely would dive again with them again. " Facilities for the deaf and hard of hearing available. One week diving and sailing liveaboards to the Similan and Surin Islands. Organizing Private Boat Charter for scuba diving, snorkeling, sightseeing & fishing and our Adventure Tours are a specialty of Phuket Pro Dive. Our team of staff is here to assist you to make your special holiday in Phuket personalized and memorable. "Our first time diving in Thailand and this Canadian Managed company in Phuket showed us a wonderfull time while being very professional and personalised service. We plan to visit and dive with Phuket Pro Dive again in the very near future. " "We got really spoiled from the relaxed atmosphere in their professionally run dive centres. The incredible dive and office staff gave us detailed Information how to use our dive vacation effectively. Located in Katathani at Kata Noi Beach we had some good Beach dives and our AOWC with their highly qualified Instructors made this dive experience unforgettable. The brand new equipment, the good equipped day boat and the very helpful crew ensured safety diving. Everything was well organised and we only can recommend this PADI 5 star IDC center to all Thailand travellers. " Offer liveaboards to Similan Islands and other destinations, PADI dive courses and daily dive trips to dive sites around Phuket and Phi Phi islands. "The friendliest, most relaxed and safest dive operation I've every dived with. The extra mile these guys go to to make your trip memorable is invaluable. I happily left a tip for everyone at Oceanic - especially little Nida who took amazing care of all of my equipment. Don't go to any other dive center in Phuket! Email ahead and Oceanic will get everything sorted for you. Outstanding service!" Liveaboard dive trips throughout the Andaman Sea, including Similan, Richelieu Rock, Hin Daeng, the Mergui Archipelago, and the Andaman Islands. We also offer trips to all areas of Indonesia. We teach PADI IDCs monthly. PADI diving courses and diving tours of Phuket, Koh Phi Phi, Similan Islands, Hin Daeng, Hin Muang, Surin Islands and Burma Banks. Will arrange accommodation, island tours and airport transfers. "Excellent dive company. I did both my advanced open water and rescue diver courses with Dive Asia and was very impressed. They are well organized, professional and very friendly. Their day trip boat, the MV Dive Asia, is excellent. I would highly recommend them for fun diving or instruction. " "I concur fully with John Gerwin's comments.Very professional and friendly. Safety first! For a fair amount you can buy a DVD from your trip. I used them for many years to my satisfaction. Staff changed over the years; quality and fun did not. Their PADI courses are also highly recommended. Excellent rental equipment. " "Very well organized, great, very experienced staff, fair prices. Day Trips and Similan cruises are both exceptional. I been diving with them for years and was very surprised that they are missing in this list. Very well organized, great, very experienced staff, fair prices. " " This summer I was again diving with Scandinavian Divers in Phuket and I will highly recommend this Dive center. Scandinavian Divers now have shop/office in Patong beach, Kata Beach Karon beach, equipment, boats, workshop and 2 dive boats in Chalong, who operate daily to different dive destinations all year round. As well as a Dive center in Khao Lak. I'm a good customer and many of my friends use Scandinavian Divers. " A PADI Dive Center offering professional and friendly service for liveaboard diving trips, local day trips, full charters and PADI diver training. We own and operate our own boats and fully-equipped facility for guaranteed quality of service. "It's not Super Divers fault but their website states that they don't have more than 4 divers per instructor, which is misleading because you think that you�re on a boat with minimal people. BUT! Many local dive shops have their customers on the same boat. You walk down 3 steps with fins on and the boats crew tells you to hurry up. Given the boat needs to jettison the divers cause it's not anchored, but some help on the exit is needed. They do help with donning your gear and giving you a hand at the aft exit platform but no help getting out of the water except throwing a rope with a bouy, they do pull you towards the boat and take your fins. So you climb outta the water with your scuba gear. The reviews about the diving are from first timers. I'm a dive master and if you want a good experience then a live aboard is best. " PADI scuba diving courses from beginner to technical. Maximum of four students to each PADI instructor and one on one individual training available. Mutilingual staff, PADI, open everyday. Koh Phra Thong is the closest land fall point to Richelieu Rock, a small submerged rock about 18 kilometers (11 miles) east of the Surin islands. An all-villa eco resort.Divers participating in the Whale Shark Exploration Programme will have the unique opportunity to "photo-tag" whale sharks to contribute to the conservation and research effort. All guests stay in private individually designed beach houses. The resort is the only one on the island and guests have access to over 10 kilometers of pristine, undeveloped beach front. Lost Horizon Resort Co. Ltd.
Ranong province borders southern Myanmar, 600 km south of Bangkok. Trips to the Similans, Koh Bon, Koh Tachai, Surin and Richelieu for four nights / five days. From Ranong. Trips to the Similans, Koh Bon, Koh Tachai, Surin and Richelieu for three nights / four days. From Ranong. Operated by a French couple, The Smiling Seahorse offers exclusive dive cruises to Mergui Archipelago in Burma as well as Surin and Similan Islands in Thailand from 3 to 8 days. Nitrox and Padi courses available onboard. The main particularity is that they avoid the crowd. MV Thai Sea, their vessels takes only 12 divers onboard in double cabins and with 4 experienced instructors onboard, they do even smaller groups below the water. English, French and Spanish spoken. "A big thank to everybody, a special thank to the cook, food was really good. Diving even better! I had an amazing time. Thank you for everything!" Liveaboard trips to the Similan Islands, Surin Islands, Richelieu Rock, Koh Bon, Koh Tachai and Burma, including north of Burma up to Mergui. "Diving center in Ranong, Thailand. Dive trips to the islands off the western coast and Burma. Reasonable priced. Great service including help with transport, lodging and other practical details. One of the few operators allowed into Burma." 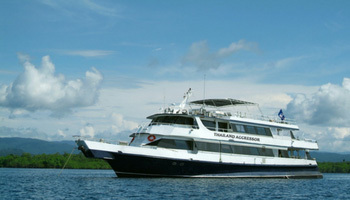 liveaboard tours to North and South Andaman Island, Tao Island and Losin. NAUI courses from Open water (beginer level), Advanced Open water, Nitrox, Rescue and Master Scuba to Instructor course. Also provide diving equipment and authorised dealer in Thailand of Rip Curl, Fantasea Line and GULL from Japan. Covers both the Andaman Sea and the Gulf of Thailand. Gives plenty of information and not just on dive sites. In fact is a mini guide book, covering travel, dive operators, money, when to go and Accommodation. Filled with colour pictures, it features sections on sea life, underwater photography and first aid. All dives are given a star rating and are well described. If you're planning to dive in Thailand you won't regret buying this book. from Koh Similan to Koh Lanta, gives full details of the marine fauna and flora to be seen, how to get to the site as well as information on the diving conditions to be expected. "The South Andaman Diveguide and the Similan Diveguide, both from Pocket Divesite, are by far the best publications on the area. " The islands and beaches edition is lighter to carry than the full guide to Thailand and includes Bangkok. 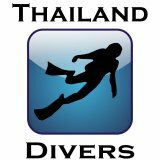 Please add your comments on diving in Thailand. Do you want to add your dive shop or recommend a dive operator? Let us know.